This is a review of a collaboration album between France's Cober Ord and The Austrasian Goat called "Et Ils Franchirent Le Seuil" which was released by Steelwork Machine and the music is a mixture of black metal, funeral doom, experimental, industrial, ambient and ritual music. 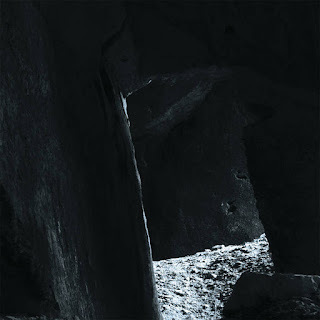 Ambient soundscapes along with some field recordings start off the album and after awhile percussion's along with some unnatural sounding instruments are added onto the recording and they also give the music more of an avant garde feeling and a great portion of the tracks are very long and epic in length. Drones can also be heard in certain sections of the recording and elements of harsh noise can also be heard at times along with some touches of industrial and after awhile grim black metal vocals start to make their presence known while also evolving into depressive screams as the album progresses and some parts of the tracks also mix in psychedelic traces while later songs shows the music going into more of a ritualistic direction as well as adding in some melodic chants and folk instruments. On this recording Cober Ord takes their blackened style of experimental and ritualistic music and mixes it in with The Austrasain Goat's black/funeral doom metal style while taking away traditional metal instruments to create something original, the production sounds very dark while the song themes focus on rituals and occultism. In my opinion this is a very great sounding collaboration between Cover Ord and The Austrasian Goat and if you are a fan of black metal, funeral doom, industrial, experimental and ritualistic music, you should check out this album. RECOMMENDED TRACKS INCLUDE "Seul" and Hades, Hades, Hades!". 8 out of 10.